Rio Grande’s Michaela Criner had six hits, including three home runs, and drove in 10 runs during the RedStorm’s doubleheader sweep of Asbury University on Friday in Wilmore, Ky. The RedStorm won the opener, 17-1 in five innings, and posted a 13-2 triumph in six innings in the nightcap. 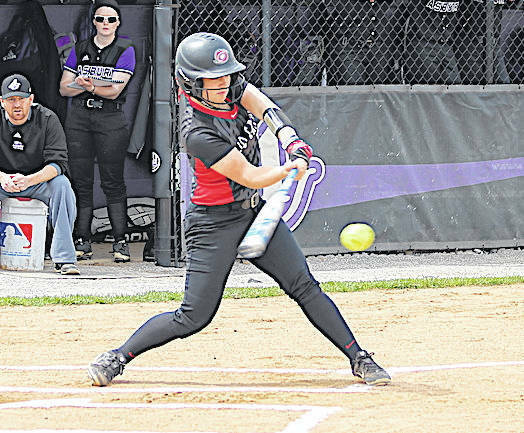 WILMORE, Ky. — The University of Rio Grande softball team brought out their collective whoopin’ sticks against host Asbury University, but it was sophomore shortstop Michaela Criner who played the role of lead bully in the beatdown. The Bremen, Ohio native had six hits, including three home runs, and drove in 10 runs to lead the RedStorm in a doubleheader sweep of the Eagles, Friday afternoon, in River States Conference play at Asbury Field. Rio cruised a 17-1 five-inning win over its host in the opener, before posting a six-inning 13-2 triumph in the nightcap. The RedStorm improved to 22-9 overall and 9-1 in league play with the two victories. Asbury dropped to 9-9 overall and 2-4 in the RSC as a result of the sweep. Criner finished 4-for-5 with a pair of home runs – including a grand slam – and seven RBI in the opening game victory. She was 2-for-3 with a home run, two walks and three RBI in the nightcap. Rio followed up consecutive five-run frames in the second and third innings of the opener with a six-run fourth inning explosion. Junior Kelsey Conkey (Minford, OH) had a three-run double to highlight the five-run second, junior Carly Skeese (Newark, OH) had a solo home run in the five-run third and Criner’s grand slam headlined the six-run fourth. Criner added a towering home run which hit the scoreboard beyond the center field fence in the fifth inning to close out the scoring. Conkey finished with two hits and four RBI in the win, while freshman Kayla Slutz (Navarre, OH) had three hits – including two doubles – and a run batted in. Freshman Aubrey Azbill (Miamisburg, OH) also had three hits and an RBI in the winning effort. Conkey started and tossed three perfect innings en route to the win, striking out five in the process. Deana Phillips started and took the loss for Asbury. Criner led off game two with a solo home run to right field to give the RedStorm a quick lead, but Asbury rallied to take a 2-1 advantage in the second thanks to a two-out, two-run double by Madison Mills. That’s how things stayed until Rio took the lead for good with five runs in the fourth inning. Criner had a two-run single to snap a 2-2 deadlock before sophomore Lexi Philen (Tallmadge, OH) followed with a two-run double to left-center which gave the RedStorm a 6-2 cushion. Rio finished things off thanks to seven-run sixth inning against three Asbury pitchers. Senior Mallory Powell (Flatwoods, KY) and junior Kelly Fuchs (Williamsport, OH) delivered the big blows in the inning with a two-run double and a two-run single, respectively, while freshman Mary Pica (Minford, OH) had a run-scoring double of her own and Slutz drew a bases-loaded walk. Powell and Fuchs both finished with two hits each in the win, while Conkey worked the first five innings in the pitcher’s circle to earn her second win of the day. Mills finished 2-for-2 and Phillips had a double in a losing cause for Asbury. Paige Hill started and took the loss for the Eagles. Rio Grande returns to action on Monday when it travels to Midway University for an RSC doubleheader. First pitch for game one is set for 4 p.m.